88000 Series Fluted Edge Veneer Furniture features hardwood veneers on all exposed surfaces, book matched to produce a uniform grain pattern. All surfaces are varnished for maximum durability. Drawer fronts are vertical grain matched. Grommets are standard on all work surfaces. Desk and credenza shells have full modesty panels. File drawers accommodate letter-size or legal-size filing. All drawers have ball-bearing full extension slides. Units are sold separately. Modular desking contains post-consumer recycled material and is Green guard Indoor Air Quality Certified. 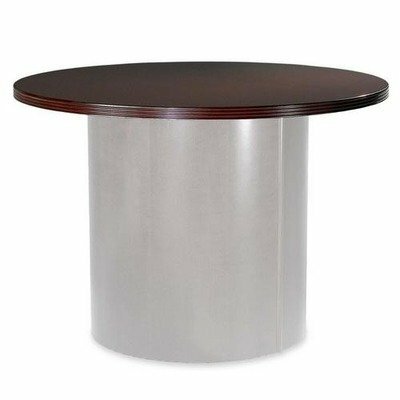 As part of the Lorell Hospitality Table Collection, this round tabletop is ideal for cafeterias or breakrooms. 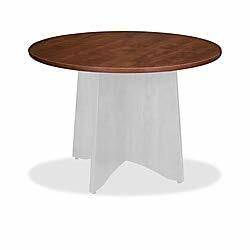 1-1 / 4 thick top is made with high-pressure laminate for an inviting place to meet or snack. Durable, stain-resistant, scratch-resistant laminate is thermofused on the top and bottom to 45 lb. density particleboard core. Design features a matching white, vinyl T-mold edge. 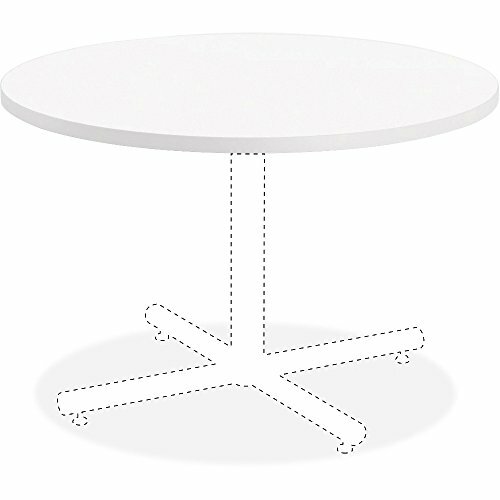 Tabletop also includes a pre-drilled hole for easy mounting of the X-leg base (sold separately). Part of Lorell's Sao Paulo series, this elegant conference table is perfect to complete an executive's office suite for an extra worksurface or effective small workgroup. Sturdy tabletop is 1/4\ thick and attaches easily to the base (sold separately) with the matching Mahogany finish. For a professional look, both tabletop and base feature hardwood veneers on all exposed surfaces and are book-matched to produce a uniform grain. All surfaces are varnished for maximum durability. 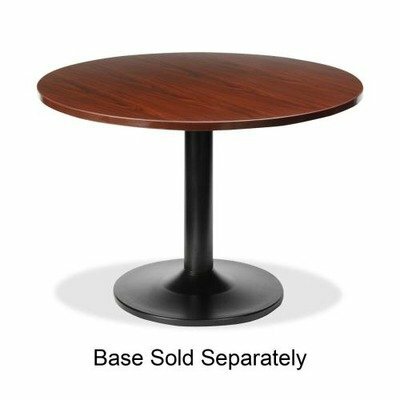 Top and base must be ordered together for a complete table. Mounting hardware is included with the base." 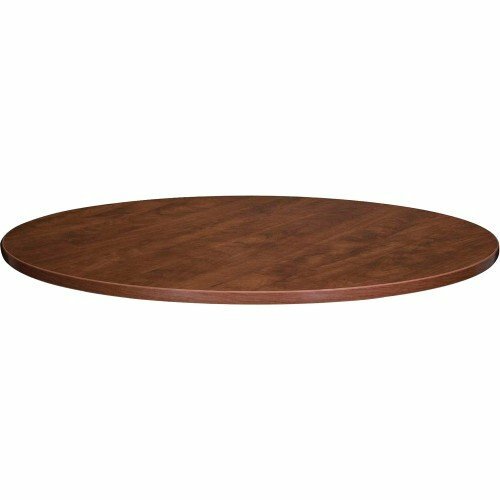 Round tabletop is part of the Loral 87000 Wood Laminate Table Collection and can be used with Loral 69000 Series Laminate Furniture. Top features a 1-1/4" thick laminate surface. Top and base are sold separately. 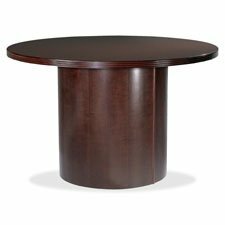 Round tabletop is designed for use with Lorell Essentials Series Wood Laminate Furniture that offers high-quality laminate construction and a contemporary design. Ideal for a small meeting area in executive offices. 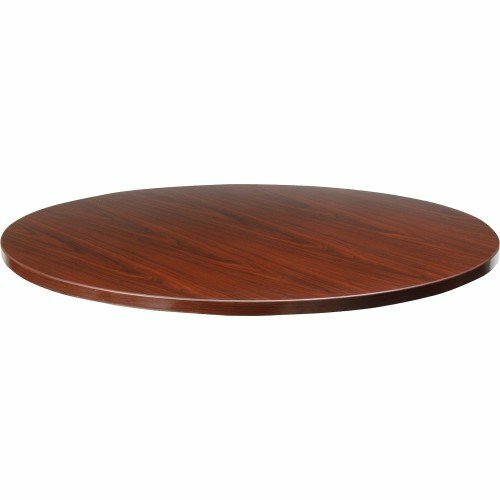 Tabletop features a 1quot; thick, Mahogany laminate surface and 3mm PVC edgebanding. 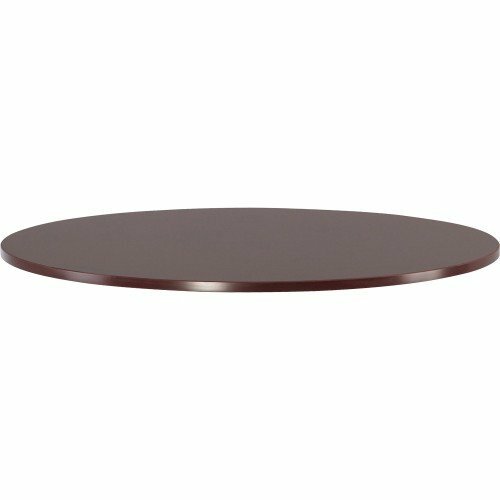 Attach this tabletop to sturdy steel or matching laminate base (sold separately) with screws matched to T-Metal, pre-drilled holes.